I arrived in France yesterday morning, and within three hours of my plane touching down at Charles de Gaulle Airport, I was in Champagne. The experience has been spectacular, from the wine itself (amazing bottles both young and old) to the food (rich and wonderful and perfectly paired with the wine) to the winemakers (friendly, gracious, and supremely giving of their time and knowldege). As much as I loved Champagne before I came here, I find myself even more impressed now that I'm walking around the region and speaking with the people responsible for it. I just returned from a spectacular visit and dinner at Pommery after spending an amazing morning and afternoon at Champagne Leclerc Briant. This great domaine was harvesting and crushing Chardonnay and Pinot Meunier today from their Premier Cru, biodynamic Les Chevres Pierreuses vineyard in Cumieres. 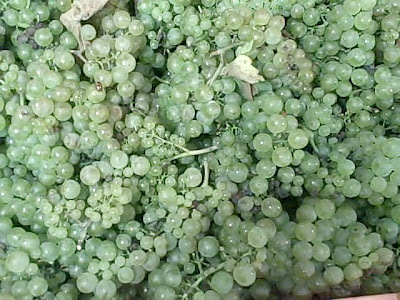 They are reporting that 2009 is an excellent harvest, with very high-quality fruit and cooperative weather. The grapes that I've seen (and picked a few of today) are just gorgeous. Check out the video below for a look at how great Champagne starts its journey to the bottle, and keep stopping back for more details from my time here.